Kit lists: they’re endlessly geeky yet endlessly intriguing. What is everyone taking on their trip? Could I make my setup lighter? Every kit list is a compromise, a balance between what you’re prepared to do without and what you aren’t prepared to drag around the world with you. They’re also a representation of fear: how afraid you are of Bad Incident X happening, how much you are afraid of the consequences, and how much you are prepared to rely on being able to buy Fixing Gadget Y on the road when you need it, or else improvise a solution in the meantime. Oh, and how much money you are prepared to spend on buying Y in the field when you’ve already got a perfectly good one at home that you could have brought with you. Here’s my kit list. It’s a bit of a fluid thing: various stuff has worn out in the four months I’ve been on the road, and I had a major kit rejig in Portland. 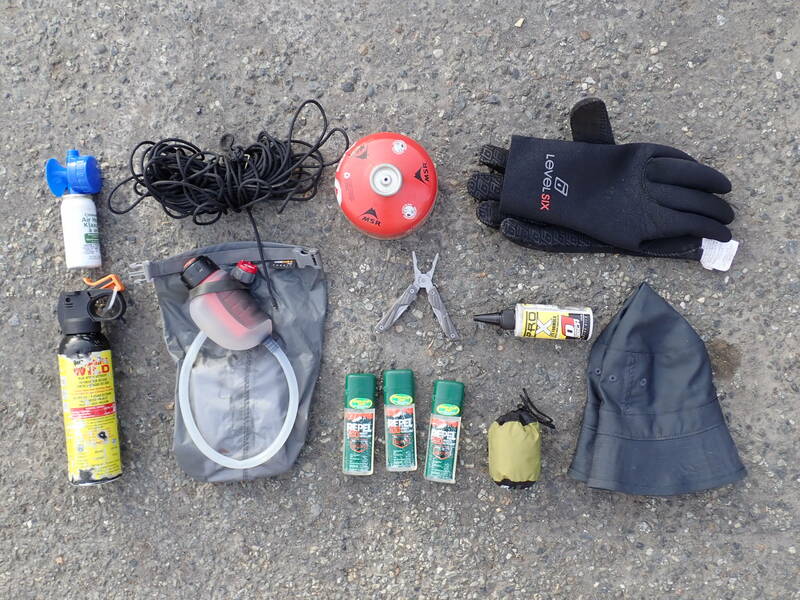 I had to carry a lot more food and supplies with me through northern Canada and Alaska, not to mention extra cold weather gear, so I posted some stuff ahead to pick up in Anchorage. Now I’ve got here I’m giving some of the cold weather kit away, while the rest is continuing with me on the trip. 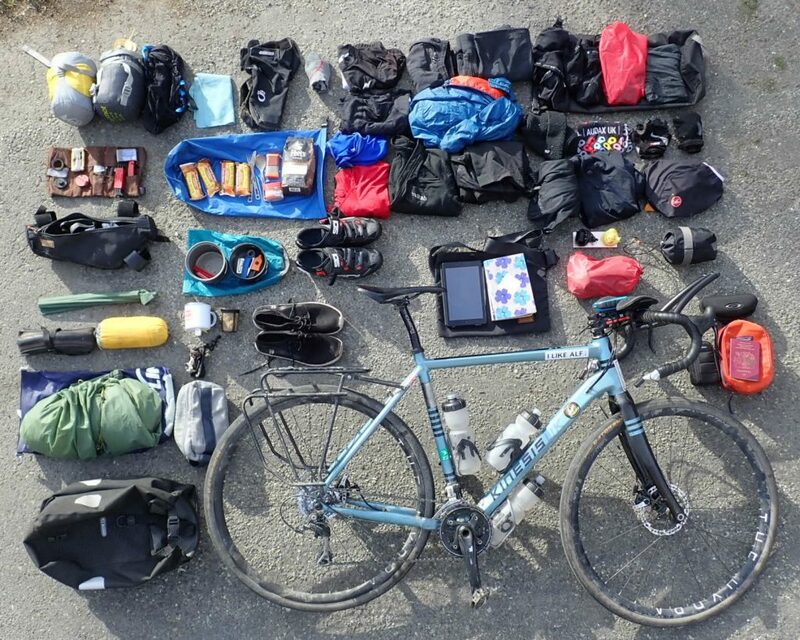 Lastly, your kit choices are defined by what you want out of the trip. If my sole aim were to ride around the world as fast as possible then I’d have a lot less stuff than I do now. 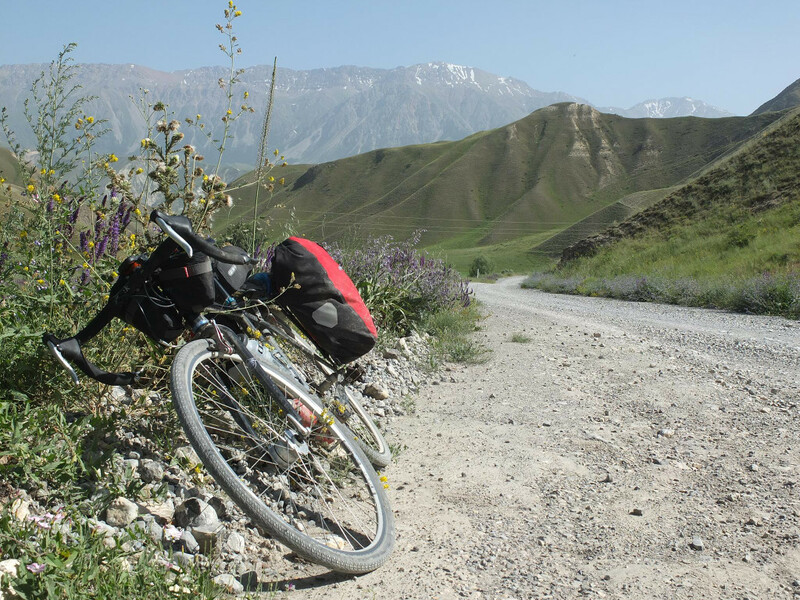 Then again, I still want to have a decent bike ride – I view the trip as a series of long rides with breaks in between rather than a world backpacking tour with the bike as a convenient pack pony – so I’m carrying less kit than a lot of people I’ve seen. I don’t have a guitar for one thing, and neither do I have a full-size laptop, an SLR camera, a folding seat or a pet dog, all of which I’ve seen on other people’s bikes. Bars: 3T Tornova bars and a 3T stem (originally some Fizik Chameleon bars but those were trashed when I got doored in San Fransisco) and Zipp Vuka Alumina tribars. Groupset: 8 speed Shimano from a variety of their ranges (Deore chainset, 105 rear mech and Altus front, controlled by bar end shifters that I think are branded Dura Ace but they’re the only ones they make). The gears are 40-28 on the front and 11-32 on the rear. Tyres: I’ve mostly been running Continental Gatorskin tyres this trip, in either 28 or 32m. They’re not my very favourite tyre – I preferred the Vittorias I had when I started – but Gatorskin are easy to find on the road. Finally, load carrying duties are performed by a Tubus Logo Evo rack. Seen here with some Alpkit titanium cutlery, some coffee, bars and spices. In Canada and Alaska my food bag would take up most of one pannier, whereas through most of the US I’d buy my evening meal at the last grocery store I passed each evening. A few clips to seal food bags. All this fits inside the two pans, and the code usually goes in there as well. I’ve mostly run with one cylinder of gas and replaced bought a new one when it started getting empty; on the northern leg I’d carry an extra cylinder.I’ve only had to divert to get gas once on my trip so far and in fact I probably didn’t need to do it that time, I was just being a bit paranoid. Other stuff: more spare patches, tyre boots, spokes, spline tool for my cassette and my disc brake rotors, brake pads, gear and brake cables, pannier clips, sewing kit. Probably a few other things too – is getting like the Black Hole of Calcutta in there. A Kindle Fire HD8 tablet for reading books and watching films. A couple of paperback books – I’ve just picked these up from the post office having posted them forward to myself from further down Canada, along with the bag they’re sitting on and some summer clothes, to make space for extra did and supplies in the northern leg. A musette bag for carrying stuff off the bike – also just reclaimed from the US Postal Service. Electronics bag (containing bike lights, headtorch, various USB cables, a couple of USB powerbanks, spare batteries for the GPS, a charger to charge to USB from AA (which I haven’t yet had to use), plus various spare SD cards. GPS (mounted to the handlebars) – this is a Garmin Etrex touch 25. I wouldn’t really recommend this model to be honest, is just what the shop had when my old one went flying off into the tarmac. Oh, and Dirk the duck. Man purse: this hangs over the tribars in front of the tent and takes my wallet, passport etc, i.e. anything I don’t want to leave on the bike. This replaced an Ortlieb saddlebag which served the same purpose but which I once left in a cafe and ride nearly 20 miles before realising my mistake. Having it on the bars, hopefully I should notice faster if I do this again. Shown here with some sunglasses as they usually live in here too. Extra thick gloves: bought in the Yukon when my existing gloves just didn’t cut it anymore.